This web page contains details on the individuals, companies and organisations which have featured in previous Wendy Warr & Associates Company Showcase pages. On this page, Wendy Warr & Associates will be highlighting a small or medium sized enterprise each month. We have pleasure in giving the very first mention to Phil Bradley, whom we have entrusted to write and maintain the Wendy Warr & Associates WWW pages. Phil Bradley is a professional librarian, and after obtaining a degree in the subject worked for the British Council for six years, heading up one of their information sections. He then moved to SilverPlatter Information, one of the largest CD-ROM publishers in the world, first to establish their Technical Support Help Desk for the UK and Europe and then as their Global Director of Training. In the last three months that he was with the company he took on the role of Webmaster for the SilverPlatter site. In January of this year he went into full time electronic publishing consultancy. In this role he runs a variety of training courses on CD- ROM and the Internet. He writes World Wide Web pages for organisations in the field of information, provides a consultancy service to help companies establish a presence on the Internet, and advises them on how best to promote their products and services in this area. He also runs in-house training courses on all aspects of electronic publishing. Phil is currently on the Management Committee of UKOLUG (UK Online User Group) and on the Board of Directors of CD-ROM SPAG. He is a regular speaker at Information events and was a speaker at the recent Directory Publishers Association Conference and at the UKOLUG State of the Art conference. This month we are pleased to recommend the company InfoChem GmbH, experts in building and processing chemical reaction databases. InfoChem was founded in 1989 by Dr. Peter Loew and Dr. Heinz Saller as a software company focusing on the production and commercial marketing of new products in the area of chemical information. InfoChem is located in Munich, Germany and consists currently of 6 permanent staff, most of them having a Ph.D. in the field of computer-chemistry. Since 1991 InfoChem has been a subsidiary of Springer-Verlag of Heidelberg. From the beginning InfoChem has specialised in the preparation and distribution of computerised information on organic chemical structures and reactions. The databases can be used on mainframe or personal computers or online at remote hosts. Distribution of InfoChem's proprietary structural and reaction database products. Database building and production of electronic products for publishers from printed sources. Development of software tools for the handling, storage and retrieval of chemical structures and reactions (e.g. automatic determination of reacting centres). In 1989, InfoChem obtained exclusive rights to what was then the largest electronic reaction database available world-wide which currently contains some 2.5 million reactions from the chemical literature published between 1975-1991. This database has been derived from a structural database of about 3.3 million organic and organometallic compounds and facts which was assembled by the All-Union Institute of Scientific and Technical Information of the Academy of Science (VINITI) in Moscow and the East-German Zentrale Informationsverarbeitung Chemie (ZIC) in East Berlin. InfoChem has all the expertise and software required for the handling and storage of this large database. In order to create reaction subsets which can be searched online via STN International, or with commercial in-house retrieval systems such as REACCS/ISIS from MDL Information Systems, Inc. of San Leandro, California, a sophisticated algorithm has been developed by InfoChem which identifies the different reaction types in this large database. This InfoChem Classification Algorithm is distributed by MDL Information Systems. Several reaction subsets have been derived from the large 2.5 million reaction file using the InfoChem Classification Algorithm. These are successfully marketed by InfoChem. Over the last two years, InfoChem has concentrated on the development of a reaction database and retrieval system for application on the PC Windows platform. This reaction retrieval system PC-Search currently allows the retrieval of up to 200,000 reactions on a PC. ChemSynth, with over 104,000 unique reaction types, was derived from the ChemReact file by retention of only those reactions which had been reported in leading journals more than once and whose yield was at least 50 %. ChemSynth is a comprehensive methodology database for organic reactions encompassing a wide range of different and applied synthetic methods. 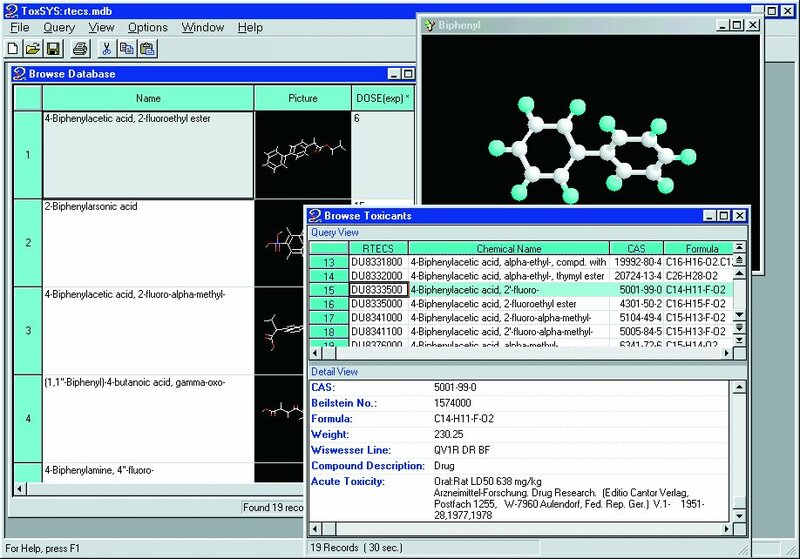 The InfoChem Chemical Reaction Database and Search System offers 41,000 selected organic chemical reactions which are retrieved using InfoChem's PC-Search reaction retrieval system combined with the InfoChem Display-File on CD-ROM. The ChemSynth database of 104,000 reactions is available with PC-Search for Windows. The complete set of 2.5 million reactions in the InfoChem Reaction Database is available in a Display-File format on one CD-ROM. The reactions included in the Display-File can be accessed and displayed using PC-Search/CD-React or with the results from an STN Online search of ChemReact. The display includes the reaction graphics including the yield and reaction conditions, bibliography and title of the original document. GOGNOS is a chemical reaction search system developed by Prof. Hendrickson of Brandeis University. InfoChem's large reaction type database ChemReact consisting of 390,000 reactions is processed with the COGNOS software on one CD-ROM. Synthesis Tree Search (STS) was developed to retrieve reaction trees for given target molecules. STS is applied to the InfoChem Reaction Database which contains 2.5 million reactions. STS can be used for a given target molecule in two directions: all published synthesis reactions (preparations) leading to the target or all published reactions starting from the target. This sophisticated algorithm has been developed by InfoChem to identify the different reaction types in a very large database. The InfoChem Classification Algorithm is currently the only available concept to structure large reaction databases and has, therefore, a high commercial value. John W. Vinson, doing business as "The Wysard of Information", is available for consulting. John has twenty years' experience at designing databases for the pharmaceutical and biotechnology industries, first at the Parke Davis Pharmaceutical Research Division of Warner Lambert Company, and for the past three years as an independent consultant. Previously he earned a Ph.D. in chemistry from U. C. Berkeley, and worked for four years on the LHASA computer aided synthesis project at Harvard. He is currently a TRS (Technical Resource Specialist) on the Microsoft Access forum maintained by CompuServe. His areas of expertise include: - relational	database design - a thorough understanding of the drug discovery research process, and how computers can be applied to facilitate it - ORACLE databases, including table design, SQL, PL*SQL, ORACLE security, and performance optimization - ISIS/Base and ISIS/Draw, including ISIS/Host connectivity, user interface design, Hview optimization - Microsoft Access, both as a front end to host systems such as ORACLE and for desktop or network use in its own right. HDS was founded in 1983 and is registered as a private company limited by shares according to the UK Companies Act (Registration number 1745321). To provide customised and packaged software and systems to chemists, to providers of information to the chemical and pharmaceutical industries and publishers. HDS also offers consultancy and database building services. The company operates from two bases in the UK, one in North London and one in Nottingham. - Chemical structure handling software or more specifically systems work involving the analysis and manipulation of chemical structure connection tables. - Extremely user friendly interfaces for drawing chemical structures that have been incorporated in a number of software products world-wide. - Chemical structure and reaction search and display software that may be linked with third party text retrieval systems or may be used in conjunction with HDS' own text search engine. - Many different styles of interface, driven from SGML coded data, with results presented to customers' specifications in a variety of reporting formats. - Contract chemical structure or reaction database building services including input of structures, reactions and associated data. Data conversion from chemical names, chemical structure diagrams or connection tables into a number of international and internal formats as well as HDS' proprietary format. We program exclusively for Windows, NT and Macintosh. At the moment, the company employs ten technical staff. Our programmers have from 10 to 16 years' experience of chemical software development and most have been with the company since its foundation. HDS also develops reaction database search systems, searchable by keywords in field structured records, ranging from bibliographic references to reaction conditions, and by chemical reaction (whole structure and sub-structure) including the ability to specify reaction sites, corresponding atoms in the product and reactant, and the reaction role. All these databases are presently available on CD-ROM and it is possible to produce REACCS versions, for example. Our main strengths are reflected in the variety of applications that we develop. The company has a reputation for responding rapidly to customers' needs and meeting their deadlines (mainly because of our small size, our flat management structure, our willingness to show flexibility and our stable team of programmers). Over the years, we have been able to capitalise on these attributes to get products to market within, often, very aggressive timescales. These strengths are clearly appreciated by our existing customers who continue to use our services. A stable team of programmers and system designers with many years experience in the chemical information field. Experience with a variety of PC based formats and porting software to other environments. Integration of text with graphics especially where the graphics are chemical structure diagrams. Working across national and international boundaries, clearly demonstrating that distance is not a problem. International reputation as professionals in chemical information software responding rapidly to customers' needs and meeting their time targets. Coming in May, 1997, a new Market study. Combinatorial chemistry provides the quickest and most efficient method for new materials discovery. Founded in the biotechnology industry and taken up by the pharmaceutical industry, combinatorial chemistry is changing the way new materials research is done. While the pharmaceutical industry is the strongest supporter of combinatorial chemistry now, its potential in other industries is clear. Combinatorial Chemistry: a Business Overview examines the many markets where combinatorial chemistry can provide increased efficiency in new product development. It also provides profiles of the major combinatorial chemistry players, lists collaborations over the last three years, gives an overview of information management for combinatorial chemistry and a listing of the major instrument providers. In addition, Combinatorial Chemistry: a Business Overview provides a simplified explanation of the technology and evaluates the worth of combinatorial chemistry. Combinatorial Chemistry: a Business Overview is written by two people with science backgrounds and business analysis experience. Available third week of May, 1997, at a cost of $3,500. Winifred F. Halsey is the principal of Winifred Halsey & Associates, a ten-year old information research and business consulting firm. Ms. Halsey has a Master's degree in Biology specializing in Molecular Biology. Her thesis was on bacteriophages of Bacillus Megaterium. Clients of Winifred Halsey & Associates include several divisions in the Motorola Corporation, including the Corporate Strategy Office. She has been providing information research and business analysis service for Motorola for nine years. Additonal clients include the NutraSweet division of Monsanto for ten years and Kraft General Foods. Prior to starting her own business, Winifred Halsey held a management/research position at Amersham International, research positions at Baxter Laboratories and Abbott Laboratories, and research positions at Northwestern University Medical Center and Loyola Medical Center. Gayenel H. Rice is the principal of Strategic Information Resources. She specializes in technology and strategy issues, providing information and analysis on companies, technologies and industries. Clients include companies in the chemical, food and pharmaceutical industries. Prior to starting her firm, Ms. Rice was a Project Manager at Teltech. She also has held Analyst positions at the NutraSweet Company and SRI International (now SRI Consulting), and analytical chemist positions at the University of North Dakota. Ms. Rice holds a BS in Chemistry from the University of Denver and an MBA from Northern Illinois University. A. What is Combinatorial Chemistry? B. How does Combinatorial Chemistry work? C. History of Combinatorial Chemistry. D Drawbacks and limitations to Combinatorial Chemistry. A. The early acquired companies: Genesis Pharmaceuticals, Selectide Corp., Sphinx Pharmaceuticals, Affymax. Acacia Biosciences, Aptein, Auda Pharmaceuticals, Cambridge Antibodies, Cambridge Combinatorial, ComGenex, DiversomerTechnologies, ICAgen, Pharm-Eco, Pharmaceutical Peptides, Oxford Asymmetry, Recombinant Biocatalysis, Sphere Biosystems, ThermoGen,Versicor. ChromaXome/Houghten, Kosan Biosciences, MorphoSys, Oceanix Biosciences. IX. What is Combinatorial Chemistry worth? ChemWeb Inc. is a US company, with operations in the United Kingdom and the United States. It produces ChemWeb.com, an online "club" for the world's chemistry researchers. ChemWeb.com delivers complete information resources for chemical research and communication via the World Wide Web. It is the first commercial Web service to combine electronic publishing, databases, journals, and scientific forums, along with informatics technologies for structure-based searching, high-speed text retrieval, and manipulation of "live" molecular structures. ChemWeb Inc. is a joint venture of Current Science Group, of London, England and MDL Information Systems, Inc. of San Leandro, California, USA. In an exclusive agreement with Sheffield University, ChemWeb.com will soon provide the ChemDex Plus index of Web sites, incorporating evaluations by Web users. ChemWeb.com is one of the first Web services powered by Silicon Graphics Inc.'s new Origin2000 server, which provides exceptional speed and responsiveness. The Silicon Graphics platform supports all ChemWeb.com databases and information management technologies, including MDL's ISIS (Integrated Scientific Information System), which aids compound discovery research and development world wide, MDL's Chemscape products, which provide access to chemical structures, reactions, and related data via HTML documents, and the BiblioteK search engine from Current Science Group, one of the industry's fastest systems for text search and retrieval. "ChemWeb.com has been cleverly designed to help researchers communicate on fast-moving topics", says James Bristol, Vice President Chemistry, Parke-Davis Pharmaceutical Research, and Editor of the new journal from Current Drugs, Current Opinion in Drug Design and Development. "This Web environment embodies the culture of chemistry. For example, the new Current Opinion journal will appear in continuous publication, making it immediately available for discussion. Authors can append data, include live structures, and generally present information in a more timely and complete way. ChemWeb.com advances the electronic literature of chemistry". Filternet - what's hot in discussion lists and newsgroups? ChemWeb.com has added powerful scientific databases that until now have only been available through proprietary interfaces or in printed form. These include The Investigational Drugs database (IDdb) and products derived from it, Macromolecular Structures, the National Cancer Institute's 3D database and an OHS Safety Series database from MDL. MDL's Available Chemicals Directory (ACD) is to be added soon. The two MDL databases are designed to streamline time-consuming business and administrative aspects of research. The OHS Safety Series database enables research teams to handle chemicals with confidence, comply with regulations, and respond to emergencies. This database of almost 54,000 Material Safety Data Sheets (MSDSs) from MDL covers pure substances and commonly used chemical mixtures. MDL's Available Chemicals Directory, available soon on ChemWeb, is the industry-standard resource for up-to-date supplier and pricing information on over 595,000 individual chemical products from 300 suppliers. It is the largest structure-searchable database of commercially available chemicals. The Investigational Drugs database (IDdb) was developed by Current Drugs Ltd. with the help of major pharmaceutical companies. The new version of the IDdb on ChemWeb is the premier source of evaluated information on drugs in research and development at over 12,000 companies and institutes. Users can combine results from searches of free-text, controlled index-terms, and chemical structures. Also available separately on ChemWeb.com are two products derived from the IDdb. "Investigational Drugs daily highlights" covers breaking news of drug research selected from news wires, scientific meetings and journals, business sources, and patents. "ID patent fast-alert" provides a weekly update on all pharmaceutical and biotechnology patents. The new version will be cross-searchable with all other journals in the ChemWeb.com library and renders active chemical structures using MDL's Chemscape technology. Macromolecular Structures, from Current Biology Ltd., is a database of more than 2,000 structures reported since 1991, continuously updated, with hypertext links to reviews from Current Opinion in Structural Biology. The National Cancer Institute's 3D database, which provides access to 126,554 compounds in three-dimensional representation, supports 3D searching by chemical structure, including substructure, similarity, and exact match searches. ChemWeb.com's library offers many new scientific journals from Gordon and Breach Publishers including Chemistry & Ecology, Life Chemistry Reports, Journal of Coordination Chemistry, Molecular Crystals and Liquid Crystals, Molecular Materials, Radiation Effects and Defects in Solids, Molecular Simulation, and NonLinear Optics. A total of 37 Gordon and Breach publications will go online in 1997. The latest electronic publication is a new journal in the highly successful Current Opinion review series, Current Opinion in Drug Discovery and Development. This will appear for the first time in electronic format on ChemWeb.com prior to appearing in print. The new journal is published by Current Drugs Ltd. and edited by three of the leading figures in pharmaceutical R&D: James A. Bristol of Parke-Davis Pharmaceutical Research, Simon F. Campbell of Pfizer Central Research, and Paul J. Reider of Merck & Co.
"ChemWeb.com now offers a critical mass of tools and resources that make it the most versatile and productive Web community for chemists", says Bill Town, Chief Operations Officer for ChemWeb Inc. "Chemists tend to think and communicate in structures, and ChemWeb.com is geared to manipulating structure-based information. We've expanded our library with important new resources for investigators and research managers. We've redesigned our BiblioteK text search engine to run many times faster and our easy-to-navigate interface is inspired by our popular sister site for biologists, BioMedNet." Is now the time to position their operations to accommodate the unforeseen demands of the future? Is it possible that drug discovery can actually be facilitated by use of recent innovations in computer science and robotics? Should professional chemists, embarking on the complicated voyage of drug discovery, try and embrace these methods? And if so, when? Are there really new tools available that will empower chemists to play their game better? The answer in one resounding word is "YES!" At no time in prior history have there been more innovations available in the marketplace than there are today. When a centuries-old industry, bent on time honored procedure, is taken and catapulted into the efficient grasp of current technology, it must fight the battle of acceptance over mere performance. Technological advancement meet the cloisters. But accept they must do, for this is one war that will rage with or without their eager participation. The up-side is that surrender of sacred laboratory territory will mean certain opportunity to the pharmaceutical industry as a whole. Oh yes, now is definitely the time, and the new tools of technology are finally in place. One such tool is an intellectual one, Combinatorial Chemistry. "A new subfield of chemistry, with the goal of synthesizing very large numbers of chemical entities into combinatorial libraries." The technique was developed by chemists engaged in "split-and-pool" combinatorial synthesis. The procedure utilizes microreactors (pieces of polymer on which the reactions are carried out), that are re-pooled during each step of a reaction sequence. When condensing a small number of reagents together, in all combinations defined by a given reaction sequence, larger combinatorial libraries are being created . The obvious problem comes when you have to identify which compounds are in which stage of the process. If it were possible simply to look at a chemical intermediate and know its structure, the process of sorting reactors would be very simple. Because we cannot do this, it becomes necessary for each microreactor to have a means of identification. The IRORI AccuTagTM-100 System addresses this problem directly by placing an RF (radio frequency) tag with a numbered bar code, directly into the resin inside the microreactor. The RF tag then works as a means of identification and tracking for each compound. When it is scanned over the AccuTag scanning station, the identifying number, along with current status and tracking information, are displayed on the computer screen via the companion Synthesis ManagerTM software, creating a database that is both accurate and extremely efficient. Further automation becomes necessary when compound libraries reach a volume in the tens of thousands. At this level, our new AutoSortTM-10K Automatic Sorting System comes into play. Accommodating combinatorial libraries of up to 10,000 members requires more than just human dexterity and patience, it requires an engineer's "dream machine"; a machine capable of fully automating the function of tracking for each individual microreactor as it moves through the sorting process. The AutoSort-10K allows the user to literally "walk away", knowing that the tedious, time consuming task of sorting is being accomplished without his intervention. These product innovations are but a glimpse at an evolving marketplace. These new tools are designed to make an impact on the way combinatorial chemistry is performed. A state-of-the-art way to do something a little better. The time has come, and the future is now. IRORI provides leading edge Combinatorial Chemistry technology to the pharmaceutical industry. The introduction of IRORI's AccuTagTM-100 Combinatorial Chemistry System in 1996 brought about unprecedented change in the way compounds are synthesized for use in combinatorial chemistry libraries throughout the world. Magister Ltd. provides a range of consultancy and training services to the technical information community, specialising in patents documentation. As an independent consultant, Magister is able to work with both producers and users of information products. What do industry searchers really need out of this new product? Are we covering the right documents, to the right depth? How well do our users understand our database? Magister is able to use its expertise to help with beta-testing of new products, reviews of patents coverage and selection policy, advice on indexing and classification problems, writing new or revised product documentation, starting and maintaining a quality control programme, and much more. Do all these new products really fit our working practices? Is that new database really as good as they say? Are we using the right source for these questions? We're new to patents; what do we need? Employing Magister on a consultancy basis would enable your staff to continue with their normal work, whilst obtaining the answers to your questions. In addition to consultancy, we can also provide independent preliminary or advanced training courses, either one-to-one or groups, for new information staff, or experienced information staff who are new to patents work. Course material is not linked to any one host, database or service, providing fresh insight into existing services. Customised courses can take your information specialists beyond the basics, not supplied by any other organisation to the same level of expertise. Even the biggest and best patent information users and producers face the challenges of shrinking budgets, reducing staff, more complex information products, and less time for "non-essential" tasks. Magister Limited was founded on the principle that there is no shortage of advice or expertise in the patents information field but conveying that expertise, to the people who matter, when it counts, in the right form, needs to be done better. The Managing Director of Magister, Stephen Adams, has a B.Sc. degree in Chemistry from the University of Bristol, UK, and an M.Sc. in Information Science from The City University, London. After a number of years working as a technical information searcher in the field of food science at the Ministry of Agriculture, Fisheries & Food, and a period as editor of "International Packaging Abstracts" at Pira International, he moved to ICI Agrochemicals (later Zeneca Agrochemicals) to become their principal patent searcher in 1988. Magister Ltd. was founded in 1997. SciVision, a division of Academic Press, is a leader in scientific application and modeling software. We offer a range of high value-added products and services for R&D professionals in biomedical and material science. High performance, interactive graphics, leading-edge computational routines, built-in property databases, and integrated pathways to provide ease-of-use are common to all SciVision products. Functionality once found only in expensive applications for UNIX workstations is now found in our products, which operate in a Windows environment on any PC or NT workstation. In today's competitive Drug Discovery R&D environment, there is a demand for the tools necessary to include more R&D professionals in the creative discovery process. SciVision has addressed this need with its new suite of discovery software, including QSAR IS� and TOX SYS�. These products have taken drug discovery software to a new level of sophistication, so that any member of your team can use them effectively. While many facilities currently make discovery software available to all researchers, these tools tend to be so user-unfriendly, and the training so arduous that usage is limited or dwindles to a select few. With SciVision's QSAR IS� and TOX SYS�, Medicinal Chemists, Toxicologists, ADME researchers, as well as Computational Chemists can be involved in the creative discovery process almost immediately. QSAR IS� is an information system designed to deliver answers and share and exchange results as to what is important quantitatively about molecules to explain their observed bioactivities or predict them. It is an excellent team tool to accelerate the drug discovery process, with all of the features you need in one product; no additional modules necessary! QSAR IS features easy to use QSAR modeling, through our "one touch" approach with genetic algorithm selection of descriptors. But QSAR IS can handle the most demanding analysis, with its leading-edge molecular and atom type descriptors (over 400), statistical routines with feedback qualifiers, database management and construction, and library screening. TOX SYS� is a compendium of known toxic effects of 240,000 compounds and mixtures, with additional databases in focused areas, such as endocrine disruptors, poisons, dangerous chemicals, and drugs, mutagenicity, carcinogenicity, skin & eye irritation, and more. TOX SYS� users can perform similarity and substructure searches of the database, batch acute toxicity prediction for new leads, and soon mutagenicity. As such, TOX SYS is a very valuable tool for early screening in a drug discovery process. It's easy to import/export data with TOX SYS so it can be used as a personal database. It's also easy to export data to QSAR IS to create structure-toxicity models. Annual subscriptions to TOX SYS include quarterly updates to the main database, as well as new databases in focused areas. In addition to expert technical support on all of our products, SciVision offers a wide range of services related to our software. From customization of our "off the shelf" products according to your specific needs, to enterprise-wide, custom solutions, SciVision is committed to making your data assets work for you. We also offer comprehensive training in our products, as well as QSAR methodologies. SciVision's products show a return on investment quickly. They are economical to deploy across your entire team, easy to learn and use, yet powerful enough for the most demanding user. But Seeing is Believing, so we'd like to come show your team how our new software tools can bring real leverage to your discovery process. In about 90 minutes, our technical sales staff can show your team how QSARIS and TOXSYS provide a competitive edge. To schedule your on-site demonstration, or for more information on any of SciVision's products or services, please call us today at 800.861.6274/781.272.4949 or email: sales@scivision.com. Figure OneQSAR IS� generated a "one-touch" model using genetic algorithm analysis and linear regression for 36 carboquinones used as anti-leukemic agents. 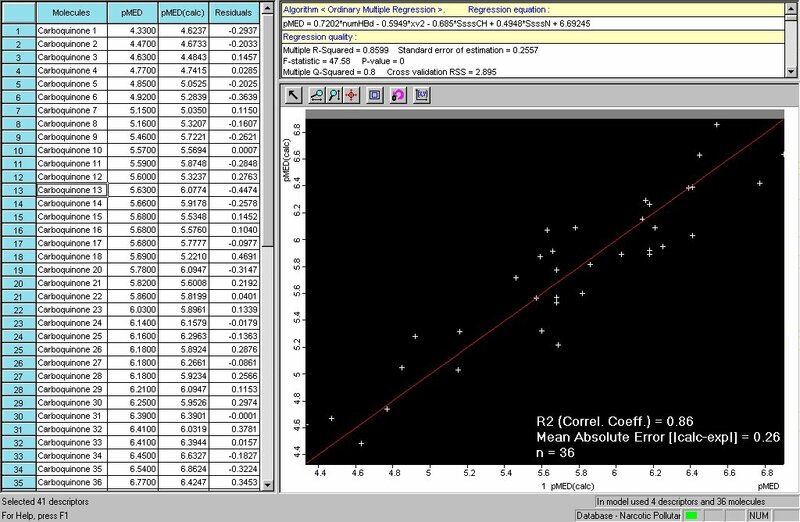 The average mean absolute error <MAE> was 0.26 with an R 2 (correlation coefficient) of 0.86. What makes one demo a raging success and another a boring failure? What can be done to ensure successful demonstrations and outcomes? The answer is simple: Do the last thing first! How can this be done? Let�s start by examining why many demonstrations fail. Clearly, there are many reasons why things can go wrong. What is the impact of a poor or inconclusive demonstration? Every year, software companies lose millions of dollars due to failed demos. Most companies don�t even know that the money is being lost! How many technical visits and demonstrations does it take to close the sale? If the answer is more than one demo for any individual, then you are throwing away money, in terms of operating costs and in the form of the most valuable resource of all: time. Further, what is the impact of a failed demo on you, on your sales team, product development, marketing, finance, administration�on everyone in your company? The impact of a failed demo is equal to the value of the sale, plus all potential future projects at that customer. It is the value of immediate sale, plus additional services including consulting, installation, implementation, ongoing support, plus the value of future products, add-on modules and other new offerings. All of these are at risk when a demo fails. The cost can be hundreds of thousands or even millions of dollars. The success or failure of your demo impacts the pending success of your entire company. So, what can you do to increase the probability of success? Turn your demo upside-down! The essence of this strategy is in executing two things. First, show your audience the end of the demo right at the very beginning. Second, focus and only show the specific capabilities needed to address the customer�s problem. This concept of turning the demo upside down may seem confusing. Aren�t we expected to put together a �story� and follow that story until we reach the end? And typically, the end shows the solution, the big �payoff� screen, which is what we�ve been working towards. Consider this: why force your customer to wait? Or worse, why force your customer to pay attention and remember your story for 30 or 40 minutes to finally get to the end � only to find that it is not what they have in mind?! Both outcomes are deadly. And expensive. The successful strategy focuses on engaging the audience right from the beginning by showing them the solution they need, right away. Once they have seen that what they need is a real possibility, they get interested very rapidly. You show your audience a solution in two ways. The first is a very rapid description of what the solution is. The second is a more thorough exploration of how the solution works. Focus on showing the audience exactly what they need � and leave out everything else that might distract. Show only the specific capabilities your audience needs to solve their problem. Your Illustration is the single most important visual tool for your demonstration. Humans are visual creatures. We often hear but don�t really listen to words coming from a salesperson. We do, however, evaluate images rapidly and carefully. An Illustration is a concise, visual method of communicating the reality of a solution. Often, an Illustration is a desired report, which is generated via a series of steps. During qualification, the sales team identifies reports that either represent the customer�s desired solution or enable decisions that are the solution. These reports can be documents, presentations, summaries, spreadsheets, web printouts, or combinations. Your Illustration mimics a report and includes the components and information desired. Your software products will either enable these reports to be created �cheaper-better-faster� or provide the ability to create reports that were previously not possible. Next, develop the �Do It�. This is the most concise pathway from the beginning to the Illustration. It is the fewest number of mouse clicks required to go from launching your software to generating the Illustration screen. No extra explanations, no additional talking, no side trips. Just do it. Your second pass through the software, the �Do It Again�, follows the �Do It� pathway, but enables exploring more options and explaining what you are doing more fully. The �Do It Again� pathway still focuses on the specific capabilities needed by the customer. Don�t get distracted; don�t show capabilities that aren�t relevant. With both the �Do It� and the �Do It Again� segments, make sure to end each section with the strongest, most compelling Illustration. Leave the Illustration up while you answer questions and summarize. This site last updated 31st August 2004.